Not a single psychic power between the lot of them. A lot of anime are set in high schools. You don’t need me to tell you that. It’s not just a matter of target audience too; even works aimed for older viewers find themselves set in high schools or featuring a teenaged cast. Evidently, high school is simply the most interesting time of life for the average anime watcher which, in a pressure-cooker society like urban Japan may well actually be true. But for all the anime about high school kids, relatively few of them are actually strictly about adolescence. Teenagers will battle with superpowers, 14-year-olds will pilot giant robots, but rarely do they sit down and just ponder what it’s like having society expecting them to make decisions on what they’re going to do for the rest of their lives. Sure, there are coming of age stories aplenty and some thoughtful slice-of-life shows, but for the most part anime is sought after for escapist fantasy, and nobody, actual high school kids included, want that bogged down by mundane worries. Enter Shoujo-tachi wa Kouya wo Mezasu, which is just altogether extraordinarily normal. Take the male lead, Buntarou. He’s not secretly a ninja. He can’t see ghosts. He’s not cursed by anything. Even in his role as a writer, he’s hardly exceptional, just sort of good and gets writer’s block like anybody else. He’s an honest-to-goodness normal high school student. Often when I’m writing synopses for anime I will describe a character as, ‘an average high school student, but,’ but in Buntarou’s case, the sentence stops there. He gets along with people, he works part time, he hangs out with friends. He’s a normal person doing normal things. And so it goes with the rest of the cast, mostly. It’s standard in a drama for its characters to be horribly broken in some way, whether it be some terrible secret, or family troubles, or a terminal illness, something to generate angst. Not Shokomeza (comedically misanthropic Atomu excluded, but he’s played for laughs). The heaviest punch it winds up is Kuroda Sayuki’s brother’s debt, and like real-life debt is dealt with but never fully resolved. There is a certain naturalistic style that pervades Shokomeza, and it’s maintained until the very end. It’s partially because of this style that I don’t think it’s really right to compare Shokomeza to Saenai Heroine no Sodatekata, a series that is similar in style but not in scope. Saekano is, ultimately, a character deconstruction, with a focus on comedy. Consider this: Saekano was very willing to reach through the fourth wall, while Shokomeza at most prods at it. I think a better comparison is probably Shirobako, the anime about making anime. Shokomeza, instead of being about making anime, was about indie game development, which is a less complicated process perhaps but was still treated with the same respect for procedure as anime was in Shirobako. I’ll even say this for Shokomeza; while Shirobako couldn’t help but dip into into the fantastical sometimes at the expense of its realism, Shokomeza never did. It’d goof off too, sure, but it never resolved any obstacles by having its characters throw out Street Fighter moves. To do other would undermine the point Shokomeza, that things worth doing are worth toughing it out for. So yeah, I’m actually impressed how excessively normal Shokomeza was. I understand it’s also something which may turn off people who look for something flashier in their anime. The drop in both art and animation quality certainly didn’t help; disappointingly, after a very functional pilot the aesthetics started going steadily downhill. Fortunately, they pulled themselves together to some degree in the finale, and even at its worse Shokomeza was not an anime that heavily relied on visuals. At least, even with off-model characters and jolting animation they tried, because keeping the cast lively is a big part of what prevented a show about the gritty work of game development from being dull. Some of them were more developed than others, to be sure (with relatively more focus on Buntarou, Sayuki and Yuuka), but for the most part they kept Shokomeza from being too normal i.e. flavourless. In the same way, the story wasn’t really about all that much in the end, but a confident pacing, good music and snappy banter made it all a very solid showing. ‘Solid’ is worthy compliment, by the way. Not all anime manage to get to ‘solid’; many just fall apart. But Shokomeza went through its motions, did everything it seems like it wanted to do, and ended well. In particular, I think it was important that Buntarou didn’t just haphazardly put down ‘game developer’ or something on his careers sheet. That would have been far too simplistic, and I would have been disappointed if Shokomeza condescended in that fashion. He’s still young, he has a short term goal, why does he have to decide the rest of his life now? I am reminded of Hyouka‘s ending, where indecisiveness was also a key feature of adolescence. And let us not downplay how hard it is to do ‘normal’ well. With the fantastical one can go wild. But with the normal, one needs restraint. The audience knows normal. And so they are less forgiving when it is done wrong. And on top of that, one has to make the normal interesting, or at least worthy of watching. So, hats off to ‘normal’ anime everywhere. Not everyone needs to aim high. More important is to know exactly where you’re aiming. I can only wonder how well it actually turned out, because this series bored me to death =01. I kept up with it until ep 7, but the characters were so underwhelming, I could not wait any further for things to develop. It may be as you say in that Shoujo Tachi is a peek at what it truly is a normal high school life, devoid of the flash and flair of other high school-based series, but if that’s the case, that very normalcy is what caused me to be disinterested in the series =0\. After dropping this, I actually was recommended Saenai as a “better” alternative to VN-making high school series, and I enjoyed that MUCH more than Shoujo Tachi, in every single way possible. I suppose a good deal of entertainment relies on your interest in game development, which I personally had. Shokomeza is much more technical about it than Saekano, to be sure. I was strong enough to sit trough 4 episodes but that was enough. It wasn’t bad, it just didn’t had anything that interested me (not counting 1st episode that managed to drag me in). And I don’t think the problem lies in this being too normal to interest. I watched plenty of slice of life that were perfectly realistic. This anime was just bland. A much better example of “average” was the game club in Oreimo (or the Genshiken trying to make a doujinshi lol)… yeah okay, using Oreimo as an indicator of average is a bad idea, but I hope you get what I mean. Usually, the ability levels of inexperienced kids should be all over the place, but it really didn’t feel that way to me at all in this series. Instead it felt really really forced. It was WAY too easy to find a “genius programmer” and a “super-popular underground artist.” Let alone having a competent actress fall in your lap, or to be led by someone who knows what’s going on in the biz in who can tell you in excruciating (and I mean excruciating) detail. Shirobako did this in a much more entertaining fashion… dunno, it just felt more “real” than this did. Buntarou just kinds of follows along because, well, why DOES he follow her along? Not enough work? Nothing better to do? I never really understood his motivation for wanting to stop writing plays and start writing VNs. No, really, I never got his motivation, other than feeling bad for her, and that’s a lousy reason as far as I’m concerned. As the show goes on, he gets into it, but his motivation is still a mystery to me, so it continued to feel weird. Animation/art-wise, it was bumpy. Average to below-average, but not cabbage-y. It looked like it was done on a tight budget. If you’re going for a tight budget, then the story HAS to be better than it was, IMO. I wasn’t personally bothered by the recruitment; nothing particularly important hinged on ‘genius’ ability; the point was just finding skilled staff. As for Buntarou’s motivation, I read it as him simply having nothing better to do. He wasn’t actually a playwright, remember, he just occasionally wrote for the drama club on request. Whereas Sayuki had a clear goal and the passion for it, which inspired Buntarou (who lacked those things). There were plenty of times when I wanted to drop the show itself the characters were bland and just go along. Oh and the conflicts also, felt like its resolution was just hastened and slip shot. Strangely, I stuck with it till the end. This kind of anime doesn’t fit well with modern audiences that if there’s nothing flashy happens in a few minutes it’ll be considered as something boring, though I personally likes this one since it’s realistic and doesn’t aim too high. It’s not about someone who’s OP at what he’s doing, it’s about normal youth and we can learn a lot from it and symphatize with him. Another things that may can make this unpopular is that people tend to look for story where they can sympathize with the character but that character is way better than themself so they can feel better or satisfied, so we have these character which extraordinarily normal like us it seems watching ourself will make people annoyed since it will reminded them with their own life. Nothing spectacular, obviously, but nowhere near one of the worst things ever either. I’m only disappointed that there wasn’t more of a romance aspect to it. Yuuka was clearly into Bunta, but they never went anywhere with that. Otherwise, I enjoyed the show. There’s definitely a bit of charm when it comes to a show just being normal. From what I understand, the Anime animated only the common route of the upcoming VN. And the common routes tend to not have romance, those start when you enter a heroine’s route. For me, it was a show that constantly hovered between being below average to mediocre. The show’s idea of generating drama is to get one of the characters to act like a jerk (redhead, I’m looking at you), before resolving it by the end of the episode. It’s boring enough, but to constantly use it throughout the series is just torture. , nor did they explore more into Yuuka’s feelings for Bunta. 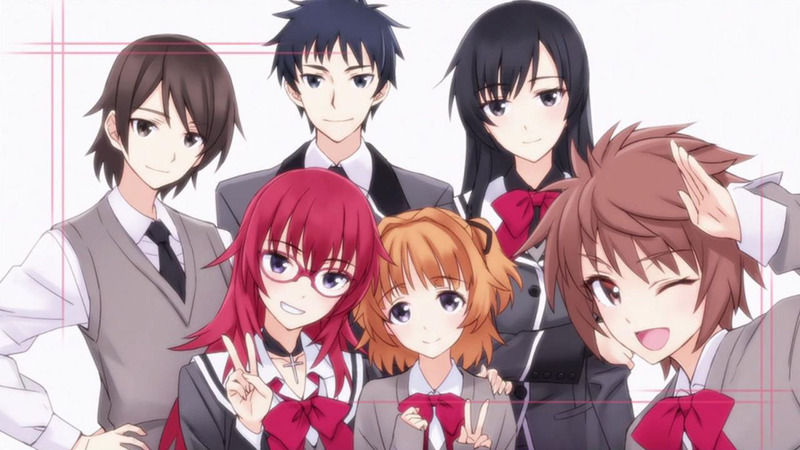 If the anime was meant to advertise the upcoming Visual Novel, it didn’t do a very good job of it. I didn’t feel like the romance needed to come to a head, since the focus was less on the result and more on the process, but to each his own, of course. By the way Saekano is coming back in 2017, spring, confirmed. It’s titled as Saenai heroine no sodate-kata flat. The main staff stays the same. Indeed, I’m looking forward to it! I dropped this show after episode 3 since it turned out to be a “spot the otaku reference” circle jerk. Did it get any better?